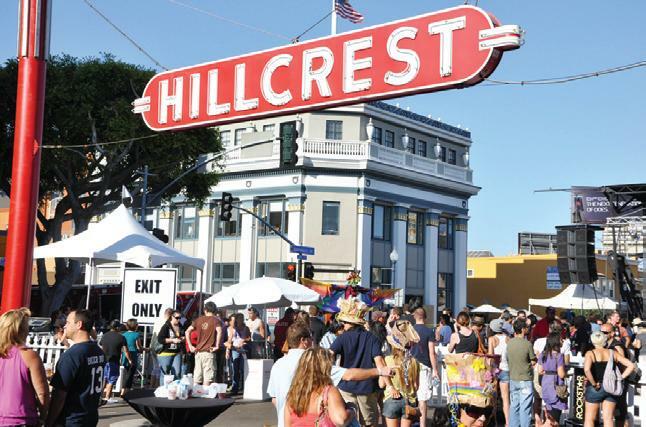 The newspaper Thursday’s Child, a feminist and lesbian publication from the San Diego Lesbian Organization, often included ads for events and workshops in San Diego. The December 1979 issue of this newspaper includes an ad for a workshop on page 7. Featuring a sketch of four women and an Audre Lorde quote, this ad is for a racism workshop. The purpose of this workshop “is for women of color and women of non-color to learn from and educate each other so that we may all work toward unity.” Sponsored by Lesbians of Color and Lesbians for Political Action, this event was for women only. The ad for this four-hour long workshop intended to reach a diverse audience by offering free childcare, signing for deaf people, wheelchair accessibility, and allowing participants to pay what they could. 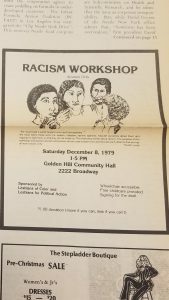 The workshop took place in San Diego on Saturday, December 8, 1979 from 1-5 PM at Golden Hill Community Hall 2222 Broadway.